From Bergheim and north, Auxerrois is the main component in wines sold as Pinot Blanc. Sylvie Spielmann has the ability to craft vibrant, complex Auxerrois without any of teh heavyness sometimes associated with this early maturing grape. Although Sylvie uses an old chain-driven press, her grape material is first class and her ideals classic in every sense. 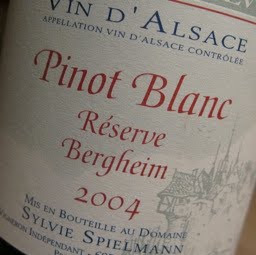 2004 Pinot Blanc Réserve Bergheim has a fruity aroma with pear and banan as well as white flowers and mint. The taste is medium-bodied, supple and juicy which feels complete on the palate, offers a wonderfully balanced acidity and a noughty touch of grapefruit bitterness in the finish. Price: €: 9.50.